I don’t know about you, but the start of Spring also tends to start the season for celebrations: babies, weddings, and graduations. From May until August our weekends will be filled with bridal showers, OUR wedding, bachelorette parties, and new babies! For my friends, when we get together- it’s all about the food (and wine). While the normal mix of dips and desserts works for most weekdays, I wanted something more elegant for nicer weekend get togethers. 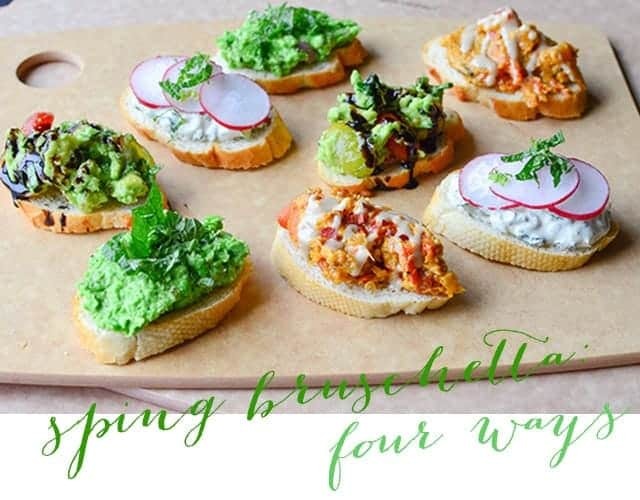 Bruschetta is one of my favorite appetizers to make. Simple to assemble and always a crowd pleaser, BL and I often make a meal out of them for lazy summer dinners. Instead of traditional tomato, I decided to top these crostini with a mix of healthy, vegan toppings. Make one or make them all, your choice! Preheat the oven to 375 degrees F. Slice french bread into 1/2″ slices. Place crostini onto a baking sheet and bake until golden brown, about 3-5 minutes per side. Promptly remove from oven and rub each side with a garlic clove. The garlic will melt into the bruschetta without needed any extra oil! Smash together: 1 16 oz. bag frozen peas, thawed, 1/4 cup mint leaves (finely diced), 1 shallot (finely minced), 1 tbsp. olive oil, 1 tbsp. fresh lemon juice. Top with shredded mint leaves and flaked sea salt (I love Maldon brand). 1 avocado smashed with 1 tbsp. lime juice and finely diced cilantro. Mix in halved cherry tomatoes. Top with minced cilantro and drizzle with balsamic glaze. Roast 2 cups butternut squash cubes with 1 tsp. olive oil and pinch salt/pepper. In a food processor, pulse together roasted squash, 1/2 cup chickpeas, 2 tbsp. tahini and 1 tbsp. lemon juice. Top with red chili flakes and tahini sauce drizzle. What upcoming celebrations do you have going on this Spring? I’ll take one of each, please! I love all the colors going on here- It definitely looks like a party on a plate. Will definitely give these a try!